There’s more to October than just Halloween and Canadian Thanksgiving. As you may know, October is also commonly known as Breast Cancer Awareness Month. Although you should donate any time of the year, lots of companies put out special pink-themed products with some or all of the proceeds going to breast cancer research. EOS is one of them. EOS (Evolution of Smooth), known for their uber-popular lip balm spheres, has released a limited edition collection with 100 per cent (yes folks, 100 per cent) of the net profits going to the Canadian Cancer Society. The collection consists of a limited edition Strawberry Sorbet Smooth Sphere Lip Balm, Berry Blossom Hand Lotion and Pomegranate Raspberry Smooth Sphere Lip Balm. The set retails for C$9.99 and is available at major retailers nationwide until November 2014. Although I think this is great value for a great cause, I was super excited to see their balm in a stick form. Although I know most people probably just buy their lip balms because of their cute sphere packaging, it’s rare to see their star product in a stick form. In fact, it’s only available in this particular set. In case you didn’t know, their lip balms are 100 per cent natural and USDA-certified organic. They also have super soft ergonomic packaging (hey, it’s all about how it looks, right?!). In case you haven’t tried their hand lotions yet, they also are quite ergonomic, fitting perfectly in the palm of your hand. The product is 96 per cent natural and the non-greasy formula is enriched with shea butter, aloe, and oat extract. All EOS products are paraben-free, as well as gluten-free. I have a ton of EOS products, including their lip balms, shaving lotions, and hand lotions, but I feel like for just under $10, this set is a great gift. Buy it early and keep it on hand as a stocking stuffer, or keep it for yourself (who doesn’t need a couple lip balms and a lotion!?). Plus, with all the net profits going to the Canadian Cancer Society, how could you let this one slip away? 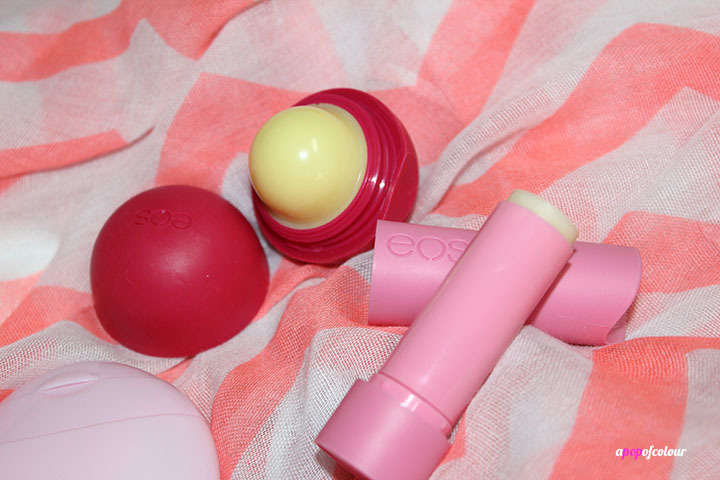 Have you tried EOS products? Please note, product sent by PR. All opinions are my own. « In the big leagues: Polo Park Mall expansion + Twitter party!